Right, we are done with this live page for today. Thanks as ever for your company and contributions. After the chaos of Saturday's qualifying session it was perhaps expecting a bit too much to hope race day would deliver similar drama, and in the end we had to content ourselves with rather processional display of dominance by those two flying Mercedes cars. But that is not to underestimate the importance of this result in the title battle, or its significance in ramping up the pressure on Ferrari as the F1 circus heads to Singapore and a circuit that is expected to be ideally suited to the strengths of the Scuderia. Lewis Hamilton was superb all weekend, delivering a record-breaking pole on Saturday and following up with a win that takes him into the lead of the championship for the first time this season. He's peaking at just the right time, and a fourth world title is now tantalisingly close. And we can't close without a word for Daniel Ricciardo, who again demonstrated just what a superstar he is with a bullish, brave and entertaining drive from 16th to fourth place. We'll see you in Singapore. And with that (somewhat underwhelming) Italian Grand Prix we bid adieu to the European F1 season for another year. Seven races remain in 2017, all of them flyaways. Fernando Alosno has been asked by Sky Sports whether there will be an announcement this week on McLaren's engine supplier for next season, with Renault expected to replace Honda. "We'll see - I think it's an important week for McLaren to make some decisions. Hopefully we'll know something before Singapore. "I need to keep looking what possibilities there are for the future and hopefully make a decision in September." Ricky Mittica: By far the best driver!!! if @danielricciardo was in a Mercedes or Ferrari he would win every race by ridiculous margins!!! Mugenyi Mathias: wow! What a performance @danielricciardo from 16th-4th! Really incredible come back to grab point & so close at the podium. "We did our best again today. After Spa and Monza, now there are some better races for us coming and we will go for it! Thanks for the continuous support!" Daniel Ricciardo, P4, speaking to Sky Sports: "It was fun and I had some good overtakes. "I will give Raikkonen the credit - he raced clean and fair but I would have done that overtake on anyone. It doesn't matter who I overtake. I knew it was going to be hard once you got nearer the front because they are going quicker. "The tyres were feeling quite gooey at one point and I think there was a little contact on the first and second chicanes. "I think we will lap the field in Singapore so we will look forward to that!" Folojimi: 2017 championship is finely poised! I believe it is going down to the wires. Ferrari has been poor all weekend so great job by Vettel. Chamath de Silva: Easy 1-2 for Mercedes. Great drive by Ricciardo... Ferrari should be very concerned. More from Lewis Hamilton: "Today was all about the team pulling together and maximising the car. It was fantastic. I look forward to coming back here next year and for the rest of this season. " Sebastian Vettel, P3: "It was entertaining - it was quite good fun! "My start was not so good - I had quite a lot of wheel spin and we didn't quite have the pace of the leading two cars but seeing the people and having that support was amazing. "We have a very strong car and will have a very strong end of the season." Valtteri Bottas, P2: "The start was tricky but I just need to keep my head down and get the places step by step. The car was so strong today. It was amazing today how quick we were. "It was a perfect result today for the team. No dramas." Race winner Lewis Hamilton: "You know what - I love it here in Italy. I love the passion of the fans especially the Ferrari fans. The energy - you never get to see it apart from Silverstone so I love it. I am happy. The team did an amazing job. "Valtteri did a great job. Mercedes power is better than Ferrari power so that's one thing. "The start was difficult - grip was quite low. "A lot of British supporters so I am happy with that." Jean Alesi doing the podium interview with Sebastian Vettel. I love seeing Jean Alesi. It's like the great Tony Curtis still walks among us. Ferrari fans are leaving Lewis Hamilton in no doubt how they feel about his win today. The BBC Sport elves are scurrying hither and thither to assemble Andrew Benson's race report. Gorge yourself on the fruits of their labours here. 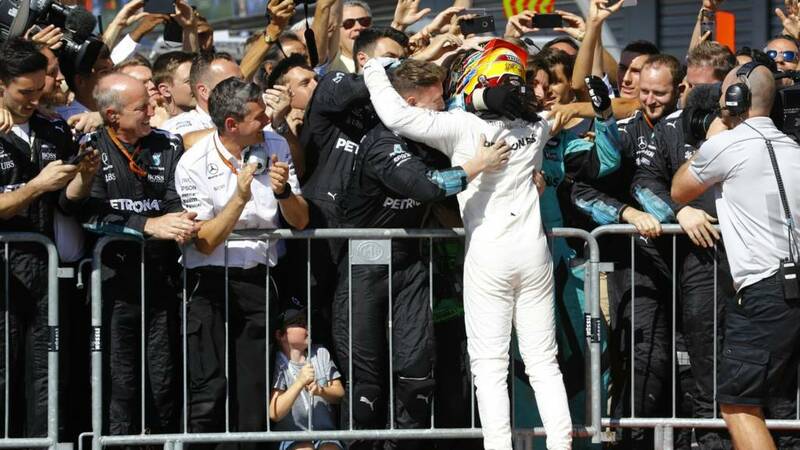 Thomas Mark Baldry:@LewisHamilton great win. Top spot as well! Rachel T: Gotta love HAM breaking records & nicking the championship lead at Ferrari's manor! Toto Wolff, Mercedes team boss: "Every bit of momentum is important. We are expecting it to be really difficult in Singapore. We will do the best we can but I will go into it sort of glass half empty."